More than 100 medical device and biotech startups applied to award pool. LOWELL, Massachusetts – The University of Massachusetts Medical Device Development Center (M2D2) today announced the finalists in its 7th annual $200K Challenge. The twenty finalists, all early-stage medical device, diagnostic, and biotech companies, will be eligible for a share of $200,000 in sponsor-provided, in-kind services. These services include use of facilities including lab and office space; and engineering, product development, legal, regulatory, clinical, and business services. More than 100 startups from around the world entered the Challenge-a marked increase from last year. M2D2 assists entrepreneurs in the medical-device and biotech sector in moving new products from concept to commercialization. It is a joint venture of University of Massachusetts Medical School, which provides medical expertise and assistance with clinical trials, and the University of Massachusetts Lowell, which offers expertise in business and engineering. The M2D2 has three locations, two in Lowell and one on the campus of the UMass Medical School. The 2018 $200K Challenge sponsors are Johnson & Johnson Innovation, the Massachusetts Life Sciences Center, Amgen, Boston Scientific, Mintz Levin, MPR Product Development, and R&Q (Regulatory & Quality Solutions). 149 Medical: non-invasive real-time brain hemodynamics and metabolism monitor. Accelera: SRS wearable technology for joint injury, eldery balance and athletic performance markets. Advanced Silicon Group: sensor to measure biomarkers in patients’ blood to give early indication of trial success. AM Protection: antimicrobial therapeutic for medical devices. Bitome: non-invasive monitoring of human hydration. CamMed: novel bandage-like, ultra-thin, flexible patch pump for delivering injectable drugs. Cocoon Biotech: silk-fibroin as a drug delivery and materials platform. DFTx: universal neurostimulation dosing platform. Fairbanks Pharmaceuticals: transformative diabetes therapy that attacks the root cause. IMS: low cost diabetes management. Leuko: First white blood cell analyzer that does not require a blood sample. MedKairos: bioptic platform to intervene during thyroid biopsies to ensure collection of diagnostic sample. NE Breath Technologies: diabetes detection and management. NERv: implantable biochip platform for detecting anastomotic leakage. Nolen Ortho: novel tissue repair materials. Prapela: non-pharmacological products that improve infant sleep. Sleep System: non-intrusive positional obstructive sleep apnea treatment device. Versatope: versatile delivery platform derived from recombinant outer membrane vesicles (rOMV). 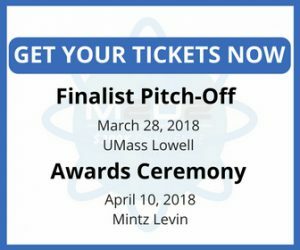 All twenty finalists will display and demonstrate their ideas at the M2D2 Challenge Finalist Pitch-Off on Wednesday, March 28 at 5:00 pm at UMass Lowell’s University Crossing. The Challenge winners will be announced on Tuesday, April 10 at 5:00 pm at an Awards & Networking event hosted by Mintz Levin in Boston. Tickets can be purchased for either or both events at https://www.eventbrite.com/e/m2d2-200k-challenge-finalist-pitch-off-awards-ceremony-tickets-43307428685.